Karen Liggins qualified as a Registered Nurse in September 2007 after obtaining a diploma in higher education of Nursing. She worked for 2 years in a Nursing post within General Surgery until January 2009, where she transferred to an A&E Nurse in the University Hospital of Leicester. During this time, Karen became a skilled A&E Nurse and Nurse Practitioner, undertaking courses Advanced Life Support, Advanced Trauma Life Support, Suturing and Plastering, a City and Guilds in Teaching and Assessing before going onto complete a Batchelor of Science degree in A&E Nursing and obtaining a Specialist Practitioner qualification at the same time. Karen has since obtained a degree in Pharmacology and in 2012 became an Independent and Supplementary Nurse Prescriber after obtaining a further degree in the study of medicines and prescribing. Karen has practiced Aesthetic Nursing since 2008, and today is an advanced Aesthetic Nurse Practitioner. She has continued to develop her skills in advanced injectable treatments, ensuring that best practice in skin assessments and Botox, Dermal fillers treatments that are offered to patients are the best in this continued advancing field. 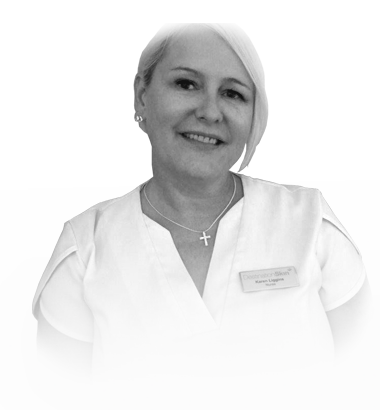 Karen has been with Koreesa Group since 2008 and has extensive experience in Mesotherapy, Fractional Mesotherapy, Collagen Induction Therapy and Plasma Rich Platelet Therapy procedures, sharing best practice with other Nurses and Doctors and Aestheticians. Karen is a member of the British Aesthetic Cosmetic Nurses Association (BACN) and subscribes to the Aesthetic Nursing Journal.